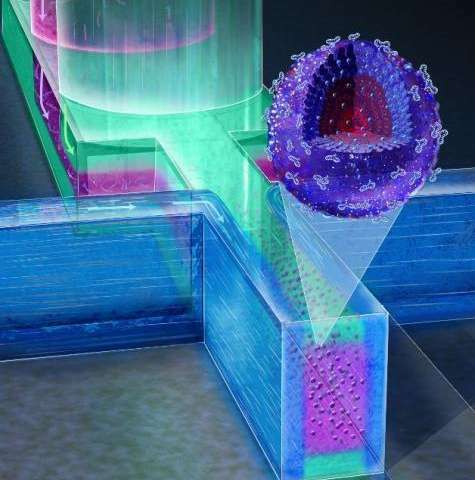 Researchers at MIT and Brigham and Womens Hospital have developed a new way to produce nanoparticles that can deliver drugs for cancer and other diseases. The new production system offers greater control over the size and composition of the particles, allowing large quantities of homogenous particles to be rapidly produced. The particles are formed from a commonly used biodegradable polymer that can carry a large number of drug molecules and release them in a controlled fashion while evading the bodys immune system. The researchers reported their new system in the Feb. 22 online edition of the journal Advanced Materials. Authors are Minsoung Rhee, postdoctoral associate at MIT and Brigham and Womens; MIT graduate student Pedro Valencia; MIT senior Maria Rodriguez; Institute Professor Robert Langer; Omid Farokhzad, director of the Laboratory of Nanomedicine and Biomaterials at Brigham and Womens Hospital; and MIT assistant professor of mechanical engineering Rohit Karnik.